Audra McDonald: Shaping 'Bess' On Broadway The actress plays Bess in the Broadway musical Porgy and Bess. The show, which won two Tony Awards, closes next month. The women of Porgy and Bess dance. This interview was originally broadcast on May 15, 2012. 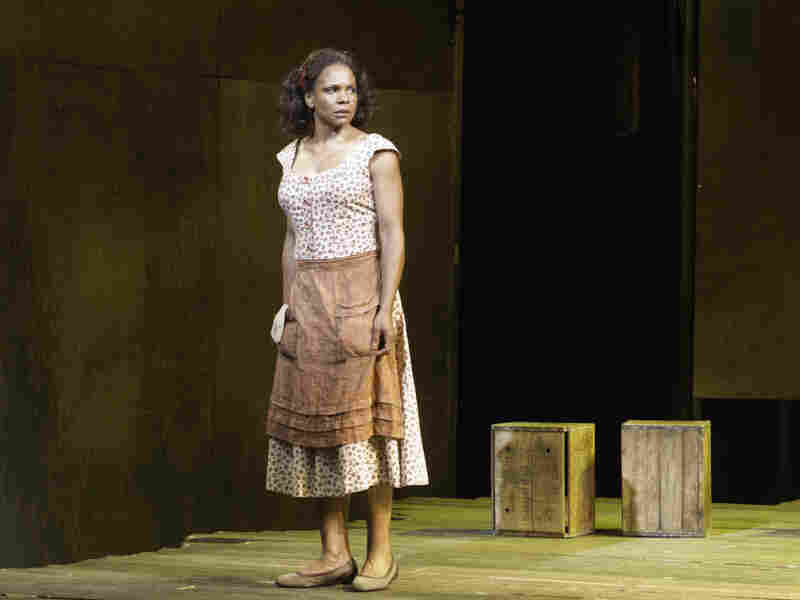 Audra McDonald plays Bess in the opera Porgy and Bess, which closes on Broadway next month. 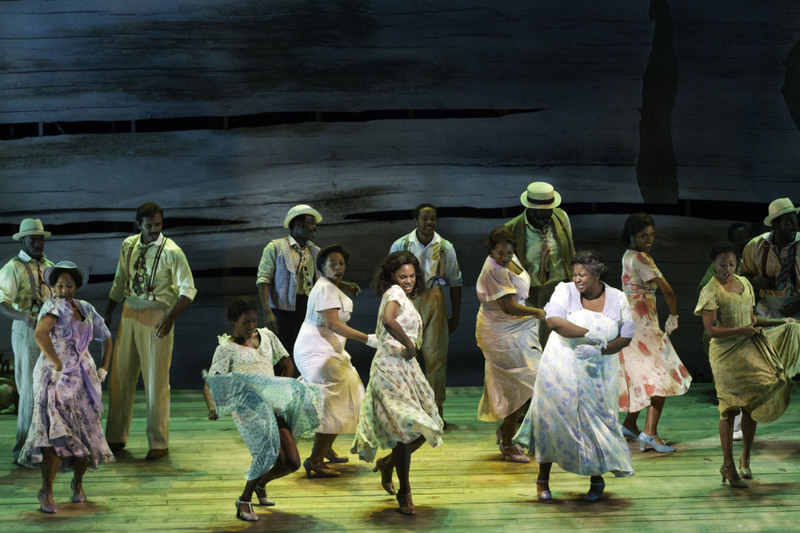 Porgy and Bess won two Tony Awards, including Best Revival of a Musical. Audra McDonald has starred in stage classics and on TV, where she played a leading role on the ABC drama Private Practice for four seasons. But the actress might be better known for her stunning voice and for her performances in the Broadway productions of Carousel, Master Class and Ragtime, which helped her rack up three Tony Awards before the age of 30. She won a fourth Tony for her performance in A Raisin in the Sun, putting her in the company of Broadway greats Gwen Verdon and Mary Martin. 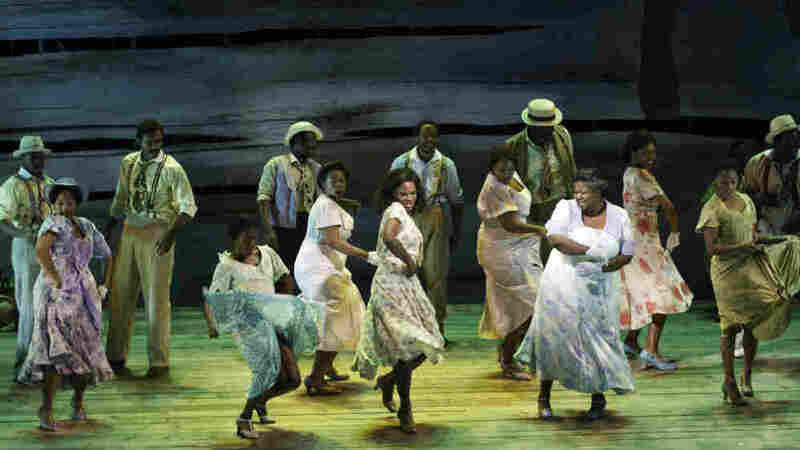 Only two actresses (Julie Harris and Angela Lansbury) have more Tonys, and McDonald may soon join their ranks, having recently been nominated for her star turn in a new adaptation of the classic American folk opera Porgy and Bess. McDonald, who plays Bess, says her own personal experiences with the Gershwin opera go back to her childhood. Her parents owned several recordings of Porgy and Bess, including one by the Houston Grand Opera and another featuring Leontyne Price. They also had a record of Sarah Vaughan singing Gershwin tunes. "She sang 'My Man's Gone Now,' and I remember being struck because I knew Sarah Vaughan as this wonderful, incredible jazz artist, and I thought, 'How is she hitting those notes? I didn't know that she had that incredible range,' " McDonald tells Fresh Air's Terry Gross. "And that's the first time I heard that aria, and fell in love with it and her interpretation. And it was the first time I realized that someone could sing more than one style brilliantly." McDonald took that knowledge with her to the Juilliard School, where she studied classical voice performance. "I was missing Broadway and thinking that's what I wanted to do," she says, "but here I was studying classically. And I happened upon the Glyndebourne performance of Porgy and Bess, with Cynthia Haymon as Bess. And I listened to it incessantly. I memorized it from top to bottom and thought, 'If I have to sing opera, here's one I'd love to sing, and here's a role I'd love to play.' "
The role of Bess is a notoriously difficult one, says McDonald. "There's very few quiet moments for Bess," she says. "They're all very big, very emotional and very rangy. And to commit to that night after night after night is very difficult." Several of the numbers McDonald performs, including the classic "Summertime," have become iconic entries in the American songbook over the years. She says it was a hard number, at first, to sing. "The last melody in the show, after an entire night of [Bess] singing and being raped and kicked and beaten and all of this stuff, is 'Summertime,' and it's a lullaby, and it's high, and it has to be high and pretty and sung to a baby," she says. "And it freaks me out that after all this, I have to sound high and pretty and fresh. And I'm always holding onto that baby, going, 'I know you're just a doll, but help me.' "
The song is a rare happy moment for Bess, where she's embracing motherhood and her own potential future.
" 'Summertime,' for me, is knowing that she's got to quiet this baby and have a bond with this baby, and making sure Porgy has a bond with this family and really trying to create this little family now," she says. "She's got a family for the first time in her life, and [she's] trying to create something safe and warm. And that's how I'm approaching the song when I sing it to the baby, and then it all goes to hell." 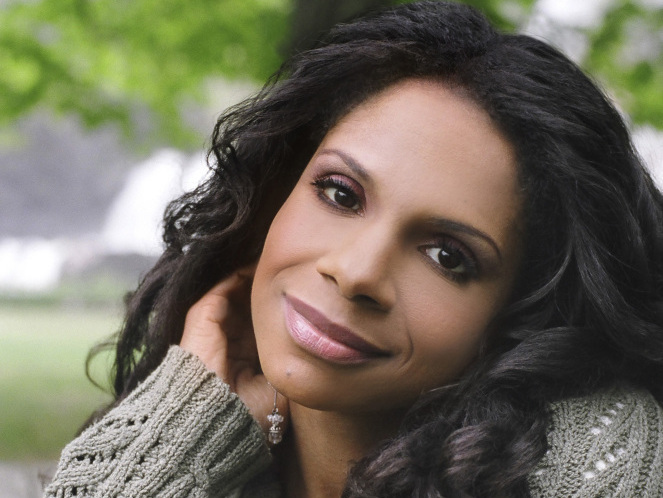 Audra McDonald plays Bess in the current Broadway production of Porgy and Bess. "[Author DuBose Heyward] really tried to get into their mindset, which was an incredible feat for that period, but it was still written at a time when blacks and whites were not commingling. So even though he researched as much as he possibly could, there were some aspects he couldn't possibly know. He didn't live it, and it wasn't a time when blacks and whites could commingle. But as African-Americans, we can bring something to it that is our own experience, which is a truer experience just by the fact that it can't possibly be anything but a truer experience because we actually are African-American. But people throughout the history of this piece have come down on both sides saying, 'This is stereotypical and this is archetypes.' "
"We had a dialect coach, a very, very talented lady, come in and speak to us about this. And we decided that we would not use an authentic Gullah dialect because no one would understand. The authentic Gullah dialect is actually very clipped, and so it would sound almost Jamaican and be very odd to an American audience's ears. It's not the typical Southern dialect that we're used to. It has a much more percussive rhythm to it. So she said it was better to use a more authentic Southern dialect as opposed to this Gullah dialect." "My agent called me and told me that this letter [appeared]. You know, you get certain calls and the phone rings in certain ways, and it just doesn't sound good. And that was one of those times. I was shocked. I knew how much Steve loves Porgy and Bess. He's never shied away from how passionate he is about this particular opera. And I think he is a genius; he is one of the great composers of American musical theater. And I respect his passion. But I know how I feel about this opera. I know how I've always felt about this opera. And I have never had anything but the greatest love and respect for this opera. So even if that's how it came across in the piece — or that's how it came across to Steve in the piece — there's not one iota of disdain for this opera in my heart. And that's apparent by my obsession with it over the years." "I've been a real loud active voice in the movement to get marriage equality. And I had gone up the month before to Albany, when they were days away from that historic vote, to rally and to see who I could talk to, and just be another face out there saying let's do the right thing here. ... I had read a beautiful story in The New York Times about the couple who were getting married, and that Mayor Bloomberg was going to preside over their wedding at Gracie Mansion. And my friend called me and said, 'They'd love to have you come and sing.' And I was floored. I was so honored. And I cried like a baby at that ceremony. And I brought my daughter. And it was a very moving moment and a very teachable moment having my daughter there. And as far as she was concerned, it was just another wedding. She doesn't really see the issue, which is great. So that's how it came about. It was a beautiful day."